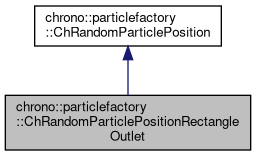 Class for generator of random particle positions scattered over a rectangle outlet in 3D space. Access the width of the rectangular outlet, that is on the X axis of the coordinate. Access the height of the rectangular outlet, that is on the Y axis of the coordinate. Access the coordinate system of the rectangular outlet. The outlet width is on the X direction of this csys, and the outled height is on the Y direction of this csys. Function that creates a random position each time it is called.